More and more HR teams want to look and feel smart and predictive analytics can enhance reporting capabilities to help understand the overall HR function. Smart companies are using HR technology to its fullest potential. It comes as no surprise that predictive analytics are gaining in popularity among our colleagues. More and more platform vendors now offer analytical tools that help companies apply collected data to better inform hiring and process decisions. In 2018, it’s a great idea for employers who are using systems that collect data around benefits, payroll, talent management, onboarding, applicant tracking, etc, to look for ways to really use this data to improve practices. For example, Ultimate Software has paved the way as a technology pioneer to use predictive analytics to determine employees who are at risk of leaving, and Paylocity has followed suit. Time and attendance metrics and looking at whether employees completed learning management/tutorial deadlines are two red flags that an employee isn’t engaged in their role and may be looking for new opportunities outside of your organization. Recommendation: only invest in HR technology if you plan to get as much value out of it as possible and leveraging predictive analytics can help you do just that. 2. Analyze the Success of Wellness Programs. Wellness programs are becoming a corporate culture norm in the wake of the Affordable Care Act. As health insurance requirements of employers evolve and change, we as a collective need to stay hungry for solutions that keep employees healthy and empowered to take advantage of low-cost preventive programs in order to avoid high-cost medical interventions down the road. Consider creating and sending a wellness survey internally to gauge interest for specific health activities or to measure 2017 employee participation. 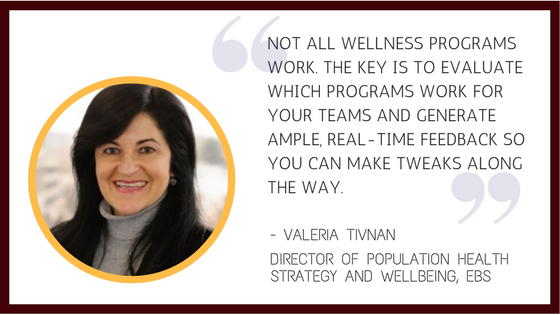 If you’re looking to build on your existing wellness program, start by analyzing your success from previous years so you can plan for this year and beyond. Measure participation trends year-over-year, analyze employee engagement and employee satisfaction. Josie Martinez, EBS Senior Partner and General Counsel and Susan Sonkin, EBS Compliance Specialist, say there are two major health and welfare compliance issues that continue to challenge most employers. Understanding WHAT health and welfare plans documents to distribute, HOW to distribute, WHEN, and to WHOM can be confusing. For example, a Summary Plan Description (SPD) should be distributed to newly covered plan participants, but the DOL’s rules of what documents constitute the SPD continue to confound many employers. If the plan is fully insured, the certificate of coverage from the insurer may or may not constitute the SPD. Our clients often need assistance to determine if the certificate by itself is sufficient or if a wrap document is required. Similarly employers struggle with HOW to appropriately distribute these documents – via mail or the web – WHICH employees need to receive them, WHEN to furnish them and how to address plan changes. The ACA and its individual mandate provisions prompted the IRS to develop a medical plan eligibility scheme designed to help stabilize health plan coverage in the group market and individual market. The underlying concept is relatively straightforward: an employee is eligible for benefits in the current policy year if he/she averaged 30 or more work hours per week during an employer-designated measurement period in the prior year. Putting the policy into practice, however, is anything but straightforward. Which employees are subject to an initial measurement period? When does an employee move from an initial measurement period to the ongoing measurement period? What happens during a non-FMLA leave of absence? The answers to all of the questions raised from this policy can fill several pages of an SPD! As you may well be aware, Americans today owe about $1.48 trillion in student loan debt, with 44 million in the borrower category. That means quite a few of your employees and potential new hires are likely facing down a mountain of debt. When more and more CEOs report that the skills gap is one of the biggest threats to their businesses, offering a student loan assistance program as part of your benefits package is more than simply a good business decision – it will differentiate you from your competitors who are vying for similar talent and will help retain some of your best people. The banking industry has already seen success from offering student loan support as part of their benefits offering. 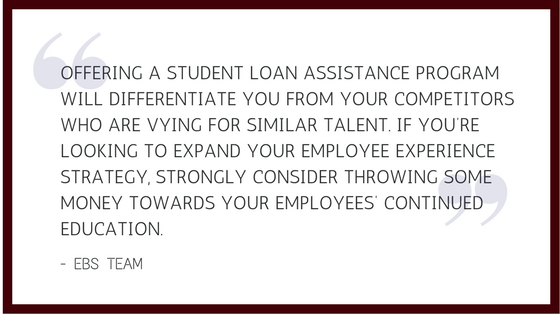 When financial firms compete for in-demand [tech] skill sets, offering student loan repayment assistance has been the differentiator in remaining an employer of choice amongst leading talent with multiple job offers. At the beginning of a new year, bonus and salary increase conversations are fresh in employees’ minds. Many people job-hop in the new year stemming from a lack of lack of personal or professional growth internally. 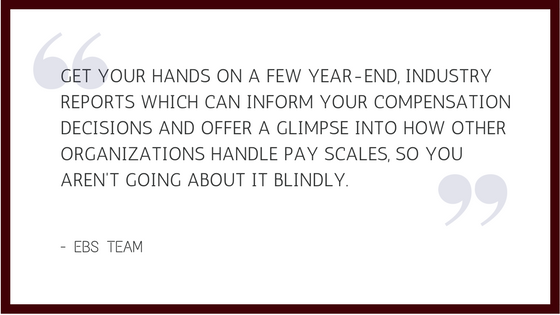 Rather than chalking this up to “turnover” it might be a good idea to revisit how, exactly, your organization handles communication around compensation. For example, we may be quick to make compensation decisions that are driven by the bottom line or investor demands. Perhaps revenue goals weren’t met or new regulations had a bigger impact on bonus payouts than anticipated. While you may not have a lot of wiggle room to work with financially, communicating the situation clearly and transparently will not only instill trust in and retain your best employees but can mean the difference between your greatest assets trusting that better days are ahead and giving you their two weeks’ notice. What’s one upgrade you plan to make to your employees’ benefits plans in 2018? We’d love to hear from you in the comments!